WoW this is fabulous! I make our drinks like this, with a little juice diluted in lots of water. These should replace sodas in vending machines! That's why I'd love to win a selection of these drinks. I would love to try the cranberry lemonade. I would love the collection as we are in the hot, hot desert and the greater variety of cool drinks, the better. Now that my daughter is a toddler and eating a lot more of the foods my husband and I eat, I've become a lot more aware of the ingredients in the foods we eat (and drink). I appreciate that Honest Tea uses quality ingredients and less sugar. I also try to support Fair Trade companies whenever possible. The pomegranate blue looks tasty and I love their mission statement! I need to keep me and three kids hydrated this summer -- we'd love to try some new flavors! Best of luck today. Sounds like you've got a full schedule! I love the Orange Mango. I'd love to win the Honest Kids to give to my son's Early Intervention class. The teachers do such a great job and provide so much, it would be great to take some of the burden off of them. Yum!! Pomagrante anything looks great! What a great alternative to those loaded full of sugar drinks that we don't need. This would be great for my son! I'd like the Honest Kids drinks as an after-game snack for my son's soccer team! Mmmm. So many great flavors to choose from. The Black Forest Berry looks interesting. Love the kids flavors too. Count me in please. What is not to like? Browsing their site led me to discover a wide variety of great-sounding flavours of beverages. The fact that they are organic, only manages to seal the deal in my opinion. With summer just around the corner, we are always looking for portable and refreshing drinks to carry with us on camping trips, outtings, and picnics. We would love to try the Pomegranate Blue, Cranberry Lemonade, or Berry Berry Lemonade. So many of the other varieties sound great as well. The Honest Kids juice drinks look great. Especially being low sugar. These look delicious and healthy - so much better for children (and adults!) than sugar-laden "juice" packs. I would love to try the kids varieties, the tropical tango punch and the goodness grapeness sounds delish and heathy too, I like that its Fair Trade and Certified Orgainic also. Has to be better than what we normally drink. Oh wonderful...my boys would love them and I deeply appreciate that they are organic! I love Honest tea bags as well. I love the peppermint and chamomile teas, and the cold pomegranate teas are fantastic. Pomegranates are filled with anti-oxidants and taste fantastic! I drink 2-3 cups of tea a day. Oh cranberry lemonade, I heart thee! This would be a fabulous prize! I don't drink much juice at all because of all the sugar and colorings. I'm especially concerned about my son and don't let him drink juice unless he's sick. Both my husband and my brother are ADHD and I'm hoping to head that off in my son. These would be wonderful to try! The Peach Oo-la-long sounds very refreshing! I would love to win this giveaway because of the environmentally-friendly packaging, not to mention the fact that I'm always looking for drinks that taste good and are good for you at the same time! 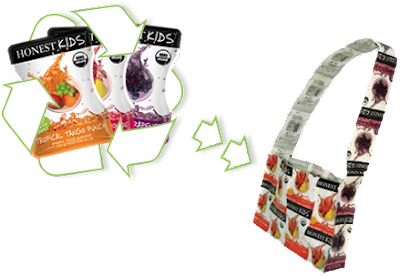 I love grape and mango, and I would love to win this recycle bag! I love Honest Teas and its a real treat to find it at my grocery store. My favorite is either Moroccan Mint or and of their Pomagranate infused teas. The first one I ever had was Honey Green Tea and it certainly made me a fan. Other teas that I drink have a very obvious taste of artificial sweeteners. I rarely drink tea now unless I make it myself or its Honest Tea. Goodness Grapeness and Pomegranate White Tea. Actually - there wasn't a flavor that didn't sound delicious. If you can ship to Canada then I'm in the draw thanks! The Low sugar is AWESOME.. I'd like to try all of them! Orange mango sounds the best to me. I'd love to win, not just for the great beverages, but because of the philiosphy of the company and how it matches mine. The cranberry lemonade sounds perfect. I am kicking the soda pop habit right now and would love to try some yummy new alternatives. I rarely find Honest Tea available here. (I'm in Canada; I'm not sure if this is open to Canadians but I'm going to leave a comment just in case because this sounds like such a great prize.) My favourite flavour that I've tried is Moroccan Mint Green Team and flavours I'd like to try are Lori's Lemon Tea and Cranberry Lemonade. I'd love to win because it's great to find organic, fair trade products. I often make my own iced tea, but I don't always have time to do that, and it would be wonderful to try some new flavours too. Cranberry and the pomegranate sound good to me. I'd drink those myself. orange mango looks the best. I would love to teach my kids about eating right and being good to the environment at the same time. The Pomegranate White Tea with Acai sounds DEE-LISH! I like the company's eco-friendly attitude! How great! I'd love to have something like this to provide an alternative beverage for my family that are not only organic but are diluted (as I usually do this anyway for my kids to cut down on the sugar intake in juices). To have ecofriendly packaging is a big bonus too! What a great product! I think the Berry Berry Good lemonade would be the favorite around here in the honest kids. Tons of the other Honest products have fabulous flavors too! I walk everyday and it'd be great to have something healthy. citrus green energy tea sounds good. I would like to win them because I love anything eco-friendly. I am having health issues, and the treatment depletes my body of all fluids. I've been directed to drink an amazing amount, 'cept no caffeinee! This sounds like a wonderful alternative! Planet friendly too...Love it! Honey Greeen Tea sounds perfect! Orange Mango sounds great. Thanks for the giveaway. This sounds heavenly! I already drink Acai with concord grape juice; but the above mixture sounds mmmmmmyummy. i want to try orange mango and cranberry lemonade. My granddaughters attend a school where water and fruit juice are the selections in the vending machine and that's what they like to drink. (Yay!) I'd like them to have a chance to try Berry Berry Good Lemondade, Cranberry Lemonade, Pomegranate Blue, Honey Green Tea and Peach White Tea. My kids want to try all the kid friendly flavors, but I want to try the Citrus Spice Decaf. I am trying to cut down on my caffeine intake, and I just love a citrus/spice blend any day of the week, so this one is perfect for me! I think I would really like the each white tea. These beverages sound really good and I'm sure would be good for you. The black forest berry is delicious. Anything low sugar. Being diabetic, I'm always on the lookout for great low sugared products. Thanx 4 the chance!!! The pomegranate blue looks great- I wanna win because I love recycling and doing good for our environment! My family would appreciate this one. Count us in. The pomegranate drinks look especially good. i like the cranberry lemonade because cranberry is good for you. Cranberry Lemonade. I adore tart flavors. We have an eco-friendly household with all reusable food/beverage carriers, napkins, etc. This stuff would fit right in. the cranberry lemonade sounds divine!! It looks delicious! Especially the Pomegranate flavor. I'm very curious about that product, I wanna try it! Let's face it - for my three year old, juice is 95% about what the package looks like, and for me, it's 95% about what's contained in the package. These would make both of us happy! Cranberry lemonade. Yum! Anything that is eco-friendly is the way to go. Save the Earth! Limeade because anything is better than just drinking water. Orange mango! Yum. I'd love to win this and gift it to my friend in VA. I'm from Seattle and most of my friends are pretty green-conscious, but when I last visited her at a shower, she and her neighbors/friends all knew 'green ideas' but most of them considered recycling their greatest and only required green achievement. Yikes! Would love to send her some juice that's fun and an easy introduction to other green ideas. Orange mango, lemon tea, berry berry lemonade....how can one choose from those flavors? I love when I find a company who has the same strong feelings about the environment as I do. This company is great for that reason. These would be perfect for my toddler - easy to transport (like the main-stream juices) but also healthy (unlike the mainstream ones)... love them!!! Oh wow great giveaway. My kids love water and with flavor that's just a plus for them. They are not allowed to drink sodas. The Pomegranate Blue Ade and Peach White Tea both sound great to me. I love the Orange Mango! I'd like to win because of their partnership with the Arbor Day Foundation. It's hard to find juice for the little ones that is tasty and good for you! I especially love the pomegranate!! love the tropical tango punch for the kids and the citrus green energy tea for me! Pomegranate Blue sounds really good! This sounds like it could replace my morning juice snack. Berry Berry Good Lemonade and the Pomegranate Blue Ade. I would love to win these just to enjoy the different flavors. My kids LOVE the tropical tango punch, but we buy it from a certain "club", lol in a variety pack. They all taste yummy w/o all that sugar! Wow, it's hard to choose! The pomegranate, cranberry lemonade and white teas all sound amazing. I love that they're good for my family AND the environment. I'd love to try it! The Pomegranate White Tea sounds really good. i would love to try all the drinks. they all sound yummy. i would trythe cranberry lemonade first though. thanks. I would love to try the Pomegranite White Tea... but there are several others that I'd buy in a jiffy! I love that it can be recycled and they are designed to be safe for the environment... we have plenty of trash in our landfills as is! Why would I like to win this wonderful juicy prize??? We don't drink soda or most juices because they are so sweet and so high in "artifical" ingredients it is scary. These appear to be more organic based and not so "mono-fructo-sucro-poly-sorby-can't pronounce it" based. That is something I can rally behind. That being said, we would love to try the Tropical Tango Punch, Berry Berry Good Lemonade and the Peach White Tea among many others. Ooh - we love lemonade and I love that this is without the sugar substitutes or lots of high-fructose stuff. We'll be having a few playdates this summer and these would be lots of fun to serve. Thanks! I'd love to try the pomegranate white tea. I love how all of their products have lower calories and contain organic ingredients. I've tried a few of the honest teas and i'm a fan! I would love to try some of this! I've been trying to become more green. Orange Mango sounds yummy! I bet they taste great and use more natural ingredients. #1 I love companies that are mindful of their packaging! I think the kids drinks sound excellent and anything pomegranate is always de-lish! Pomegrante green tea and love the eco-friendly packaging!!! Lemon Black Tea. This would be better than the junk we drink now. Organic is the only way to go! I love organic! The world would be a better place if we all went organic! I would love to try the pommegranite or the blueberrry. I love drinking "green" and healthy ~ and the flavors sound delicious :) *Thanks* for the giveaway! I think both the Citrus Spice Decaf and the Black Forest Berry sound tasty---would like some new summer drink choices for the hot summer coming up soon. I'm addicted to their Peach Oh-La-Long. Yummy! Loved alot of the jewerly. Good site. I would like to try cranberry lemonade. Thanks for the chance. The pom tea looks super good, and I love the juice boxes for the kids! I have enjoyed their beverages in the past and they are terrific! The limeade sounds so refreshing. I think it's always great when a company tries to make drinks a little bit healthier. I try to avoid all the sugary drinks, but it's no fun to drink plain water all the time. This sounds like the perfect drink for me. My kids drink most of the juice beverages in our house, so I would like to try the Berry Berry Lemonade for them. Goodness Grapeness, sounds, well, quite good. I'd like to win these for my daughter so she has something healthy to drink in the house. Grape Goodness looks absolutely yummy. Also anything mango in my book is lovely. I would like to win an assortment of these b/c my kid will love them. Gosh I would love to try the drinks for kids. What a great idea, and I love their design. Orange Mango, yum! I like the eco-friendly packaging and the natural ingredients for my kids. Moroccan Mint Green Tea sounds heavenly for those hot summer days that will be here shortly! And anything all natural sounds good to me! I like that it is fair trade and that I don't have to worry about the ingredients. Many delicious choices! I like Cranberry Lemonade, Lemon Black Tea, Honey Green Tea, and Black Forest Berry Tea. The Pomegranate one looks delicious! I'm super picky about my kids' food and beverage intake, and the Honest Kids pouch drink line sounds awesome. Pick a fav flavor? Very funny! They all look great! And Keeping things natural for my daughter is a plus! Anything with peach or mango is first on my list. And the pouches are absolutely perfect for my son! I lov ethe black forest berry tea and would love to try the honest kids for my little ones! Such yummy flavors and such a good alternative to juice!! I'd love to use these to introduce my daughter to juices instead of the regular juice stuff! I've held out and just had her on water and milk so far! Thanks!! Those pouches would be great when we're out and the girls are thirsty. Healthy, tasty & recyclable!! My 3 yr. old boy is a juice-a-holic. SO I try to find him healthy ones. Cranberry lemonade sounds so good. I love this! I have a 4 year old, so she would be a happy consumer. She'd also be thrilled with the packaging! She's always looking "for triangles, mommy (recycle symbols)" so she'd be thrilled by this! I'm making more of an effort to buy more earth friendly products and buying from earth friendly companies. My kiddo likes the juice and I'm adding white tea to my diet (thanks Dr. Oz!) so the cranberry lemonade and peach white tea would be my first trys. Thanks for the giveaway! Tropical Tango Punch... mmm! I don't have a lot of storage space, so I love the idea of having more of a selection of organic juice than I could normally store. The Orange Mango sounds yummy! I would love to win to give my kids a healthy choice of drinks. The cranberry lemonade sounds delicious. I too am trying to purchase products that are healthier choices to the mainstream grocery store brands- preferrably organic and fair trade, better for the environment. It is so hard to do where I live. I also am looking for healthy "treats" for my preschooler and these sound like a terrific option. Thanks for this giveaway. We are trying to eat healthier. I love green tea and would probably like variations of it. Thanks for the giveaway! The Honest Kids Berry Berry Good Lemonade sounds amazing. I hate the artificial sweetners found in most lower sugar drinks. I dont think they are good for you at all (and yes I am still a diet coke fiend--something i am really working on), so these products are awesome. Less sugar without the yucky add ins. the berry berry lemonade sounds yummy. I would love this since I always dilute my kids juice at home but for school those refillable juice containers always seem to leak but juice boxes are so high in sugar. This would be a win-win in our house. Goodness Grapeness!! Just the name is great! I'd like any of the teas for me. All the flavors sound great! My daughter loves juice boxes, so this would be perfect! These look great! The limeade looks so refreshing and I always love a cranberry lemonade. I love their mission. How often do you see "integrity and purity" in a company's mission? Not often enough! i started eating/drinking organic when I first got pregnant and am hoping to keep up with it even after the baby arrives (3 weeks or less!!!) ..this would be SO helpful in off-setting the $$ cost! Ohh the pomegranit ones sound good. I want to win because I can't really find stuff like that in my small town. I've always liked the Moroccan Mint Green Tea, but I didn't know they had so many other varieties or beverages for kids. My kids lurve the Berry Berry Lemonade but my goodness everything sounds yummy!!! Count us in! What a prize! Goodness Grape! Thanks for the giveaway! Oh we'd love to try these drinks! The cranberry lemonade sounds DELICIOUS! Thank you for the great giveaways! Oh yum. I always buy organic and fair trade items. So a product like this fits my lifestyle. I'd love to try the Honest Ade. It looks so refreshing for just relaxing or after a workout. I can't even pick a flavor they all look so darn good. Thanks. I think everyone is trying to go a little greener these days. Happy 10th Anniversary Honest Tea!! My daughter would probably love the Berry Berry Good Lemonade flavor. We'd like to try them because of they are nutritionally better than other kids drinks - organic ingredients, that's definitely a plus! Tropical Tango would be our choice! so many yummy flavors! I'd probably like orange mango or pomegranate best. I'd like to try these because they sound good and I'd like to offer my daughter a healthy juice too. Pomegranate looks wonderful! I think this is such a great idea - I love that the packaging is recyclable! So many look good. My kids would love the Berry Berry Good Lemonade, and I'd love to try the Pomegranate White Tea. We buy fair trade coffee, and talk to the kids a lot about trash and buying products that don't come with a lot of wasteful packaging. So that's why I love Honest Tea's philosophy, and I'd love to try them. Pomegranate is my kids' favorite flavor of all time! What a great giveaway and an awesome product! I would love to try these because I had never even heard of them before. The Cranberry Lemonade sounds really good right now. I would love to win because the flavors sound so delicious! I especially like the sound of Berry Berry Good Lemonade and the Peach White Tea (I'm a little obsessed with peach flavor right now). the flavors sound so good! ...especially the pomegrante! Great giveaway!!! i was all about the pomegranets until i saw the berry good lemonade. yummy! I've never tried this brand of beverage before, although I've heard about it. I'd like to win because I love trying new drinks, and what a bonus that the packaging is eco-friendly. The orange mango with mangosteen drink sounds especially delicious. I would love to try the cranberry lemonade. I just got an email from this company today, I like the name they chose for the company. I like their mission also. Orange Mango, pomegranet, they all sound delicious and good for you too. I love the Honest Teas (of course, anything with Opus on it has my vote), and they're so hard to find! These all look great, and would be great for the upcoming summer! The peach Oo-La_long sonds good. mmm cranberry lemonade. I would LOVE to have healthy packaging for my children's drinks! Pomegranate white tea sounds lovely, though they all caught my eye! I am using more eco-friendly products as I find them. I LOVE Honest Teas! I did not realize they made kids drinks as well. I have yet to see these in stores. My daughter would love the Berry Berry Good Lemonade as she is a lemonade fanatic. Wow! These all sound great to tell the truth, but if I had to pick I suppose I would go with the Orange Mango, Peach White Tea, or Pomegranate Blue. The Honest Kids Berry Berry Good Lemonade sounds scrumptious! I really want my family to make healthier bevarage choices and this is just the thing to try! Thanks! My kids would love to try the Berry Berry Good Lemonade and I think I would like the Cranberry Lemonade the most. I would love to try these and help out our planet at the same time. I am trying to cut back on the amount of trash we have and recycle more! Honest Ade Orange Mango looks divine!! I love it that it contains Mangosteen! I am getting thirsty thinking about how it would taste! The kids beverages would be gulped down by my kids! Especially the Tropical Tango Punch! I love that they are not loaded with sugar! I love the Honest Teas in pomegranate, lemon and honey. I hope I win because I am a health freak and trying to incorporate more healthier food choices in my diet and I'm also trying to become more environmentally conscious. I have just recently started composting so every little step I take is a good start! I've never even seen one of their products before, although I'm sure I would enjoy them. I appreciate that they are committed to be socially responsible. Thanks for doing the giveaway! Peach white tea and any of the Honest Ades. These look so refreshing and delicious. My two favorite beverages are tea and lemonade, so this couldn't have been a better giveaway!! I'd love to try both of these, and some of the rest I saw there! I love quality ingredients in my food and drinks, so I'd love to try these. Thanks for offering this.